MORRISTOWN, NJ. 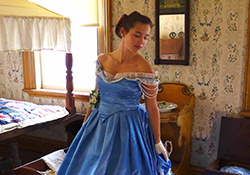 On Sunday, May 19, beginning at 1 p.m., step back in time, and enjoy the 11th Annual Historic Fashion Show - Fashion Wars at Historic Speedwell in Morristown. Discover how fashion was influenced as models showcase clothing from before, during, and after memorable conflicts in American History. Interact with the models as they describe their clothing in great detail and discuss life during that time period. Tours run hourly between 1 p.m. & 4 p.m. Admission is $7 per adult, $6 per senior, and $5 per child. For more information and directions to Historic Speedwell in Morristown, please visit morrisparks.net or call 973.285.6537.